The Big Idea: There are lots of ways to help children connect home and school. 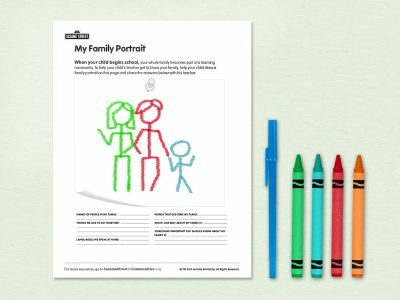 Print this page and encourage children to draw a picture of their family. Write their thoughts in the blanks. Siblings can also do this activity together—encourage everyone to share their answers. How are the answers similar or different? Children can take the completed page to school to share with their teachers and classmates, to help strengthen the home-school connection.